If you’re running an appointment based business you’re probably painfully aware of the cost of no-shows and missed appointments. Whether you’re taking bookings for an office based business (doctor, dentist, hairdresser etc) or for onsite appointments (building inspections, electricians, plumbers etc) it’s important to have a system in place to remind your customers about the upcoming appointment in advance. Appointment reminders can be sent by a staff member each day (for example to remind everyone about appointments tomorrow) or scheduled to be sent automatically by FileMaker Server. 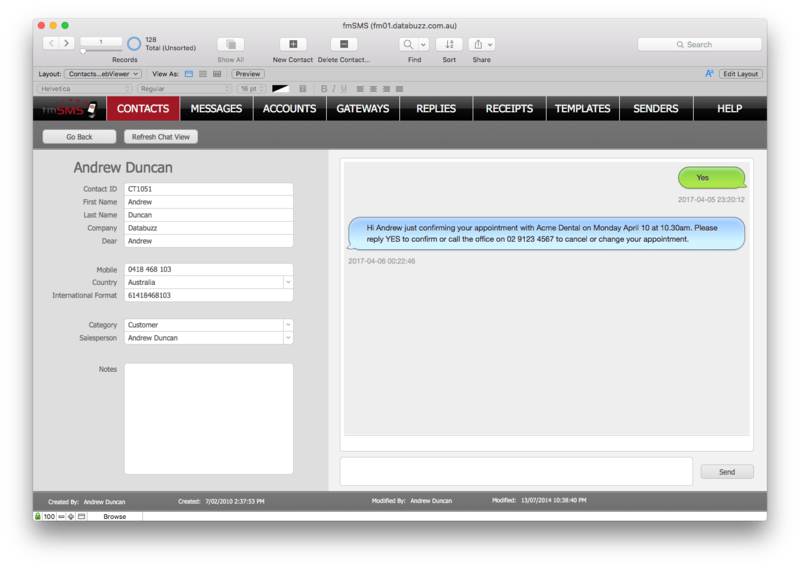 You can also take advantage of 2 way messaging to allow your customers to send a reply via SMS which is routed directly back into your FileMaker solution. One customer was able to replace a process that took 2 staff members over 90 minutes to contact all customers to confirm their appointments for the next day with an automated SMS reminder system that sends out hundreds of appointment reminders in under 5 minutes. If you would like to discuss integrating SMS appointment reminders into your FileMaker solution please contact us for a free initial consultation to discuss your requirements. Our fmSMS solution is also available if you would like to have your existing in-house/external FileMaker developer perform an integration using our ready made solution.